Fully waterproof Bluetooth earbuds with a marvelous battery on a budget. 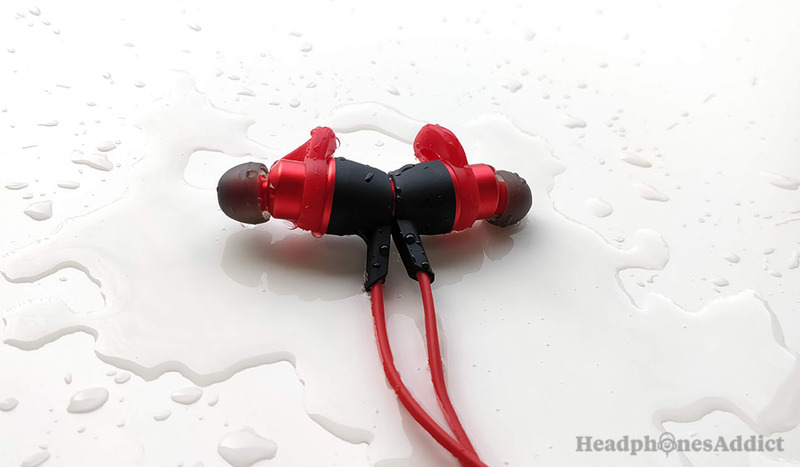 Origem HS-1 are waterproof wireless in-ear headphones designed for active people who are always on the go no matter the weather. These Bluetooth workout earbuds feature quite a few pleasant surprises, given their low-end price of under $40 (as of writing this). If you need wireless earbuds on the budget and water-protection, check these out. We tested the model in beautiful red color. The earbuds’ size is large. When you look at the size of the earbuds, you think these can’t be comfortable as they’re too big. In some sense, this is their main problem. 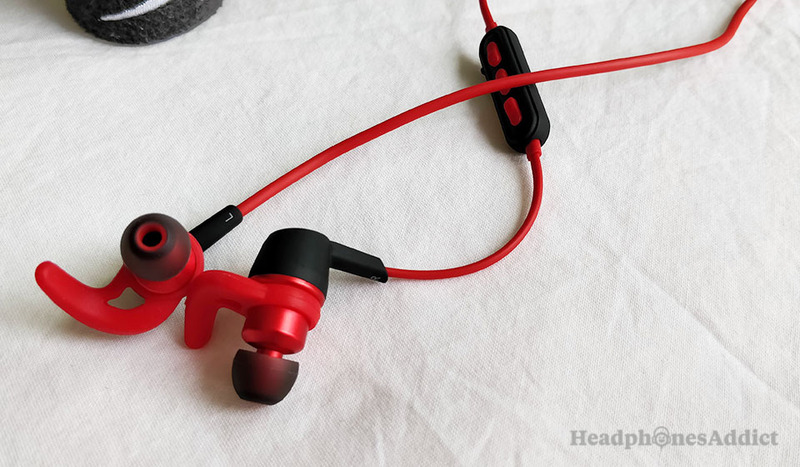 They’re bigger and heavier than comparable in-ear headphones, but once you find the right combination of ear wings and tips, the fit is very stable. Using the ear wings is a must as otherwise the buds often fall out. You get 3 sizes to choose from, so these will fit most people. It’s easy to walk, jog, or do any other fast movement—definitely suitable for running. You won’t have to adjust the fit too often. Now when it comes to comfort, these aren’t the most comfortable earbuds we’ve seen but do a decent job of keeping your ears pleased. The main concern, as mentioned before, is the size and weight. You’ll feel these are a bit bigger, but you will eventually get used to them. Honestly, we only felt the difference when comparing side to side with lighter buds. When you wear them for a couple of minutes on the run, you’ll forget you’re wearing them. Plus, you get bonus 2 pairs of foam ear tips—together with 3 silicone pairs—that do a better job at noise isolation and comfort. The foam ear tips are rare in this price range and are a nice touch. The right and left sides are evident from the ear wing design, but you can also rely on small white markings on each earbud. 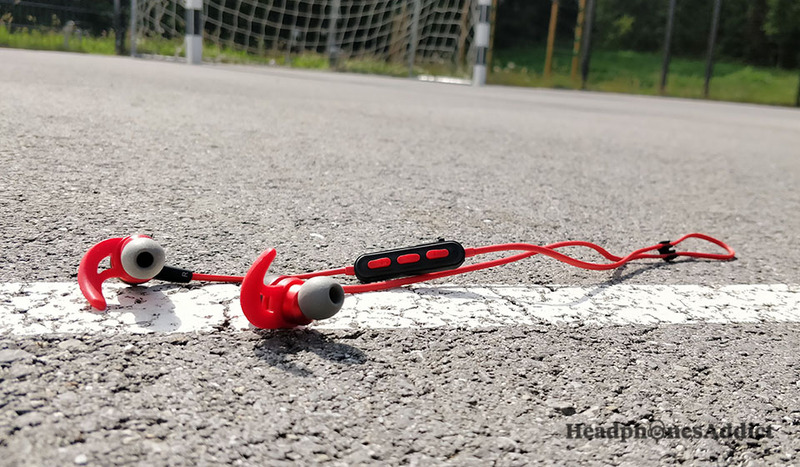 Overall, the Origem HS-1 might need some more readjusting than the most comfortable workout headphones but are pretty close and will more than satisfy an average sportsperson. As is the case with in-ear monitors the passive noise isolation is terrific. It lowers traffic commotion substantially, and you’ll generally have to pause the music to talk to people. Effective noise blocking comes in handy at the gym, when you want to focus on your reps and not be bothered by some guy making loud noises nearby. However, if you’re running in the streets and need situational awareness, the Origem HS-1 isn’t the best choice. Too much isolation makes it dangerous to jog near cars. In contrast, running on pedestrian paths and countryside is perfectly safe—which is also the preferred way to run for most people. The cable—which is slightly flattened but still round—doesn’t produce any cable noise. It’s a non-issue, and this makes it great for all kinds of workouts. Additionally, we had the opportunity to test them in a windy environment and the wind noise, while present, is not strong enough to be annoying. Listening at half volume is enough to overpower the wind noise, so it doesn’t bother you. Charging for 5 minutes give roughly 2 hours of playtime. The Origem HS-1 use Bluetooth 4.1, are easy to connect to any Bluetooth device and have the average range of about 30ft (10m). The signal strength is generally stable though you’ll experience some distortion if you put a wall between the wireless earbuds and your music device. Thick walls with metal inside seem to be kryptonite for the Bluetooth stability. Nonetheless, without the wall, it works as intended. Moreover, every time you turn them on a voice prompt tells you if you’re connected, or not. Also, you can connect 2 devices at the same time which is welcome when you want to use your Bluetooth MP3 player for music but still be able to accept calls on your smartphone. 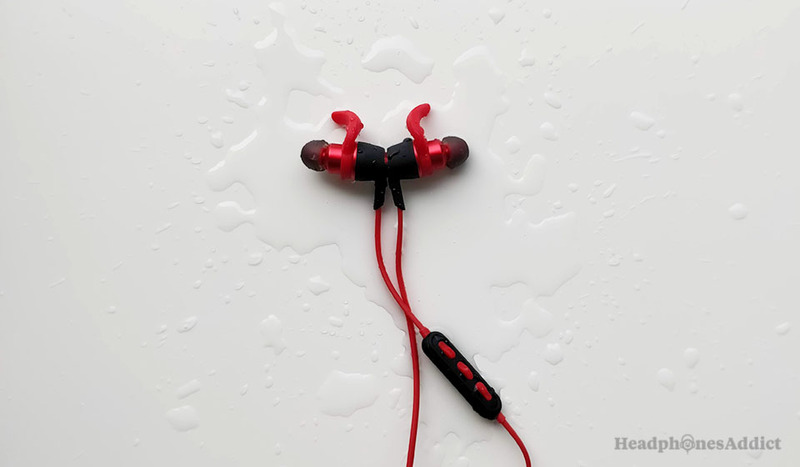 The battery life is one of the better aspects of these waterproof earbuds. Because, on a full charge, you get up to 10 hours of playtime which is more than most Bluetooth workout earbuds offer. Especially for the price around $35 ($36.99 as of writing this). The earbuds come charged out of the box so you can use them immediately. You can charge the battery with the standard MicroUSB cable which is also included in the package. A sweet feature that’s not usual in this price range is quick charging. You’ll get a full charge in around 30 minutes. It’s one of the best battery performances among wireless in-ear headphones at the moment. Furthermore, when connected to a smartphone—iOS and Android—you get a battery indicator showing you how much power you have left. If that’s not enough, a red light flashes on the remote control and you get a “battery low” voice prompt telling you; you should charge up. Still, there’s an error with the voice prompt. When you shut off the earbuds, the voice prompt says; “Power off. Your device is disconnect…sh”. Apparently, they didn’t give enough time to the “voice-prompt lady” to finish her sentence. No worries, it’s a minor problem. They are built from plastic and rubber materials that feel sturdy to the touch. The cables are slightly flattened but still rounded and protected by flexible rubber. Just from looking at them you can say these are well built and should last a while. A nano-coating makes them fully sweatproof. To make you even comfortable taking these to the extremes, they’re IP67 certified. It’s IPX7 equivalent which means you can easily take a shower and also dip them in water for a while. Just keep in mind, you can’t use them underwater as Bluetooth doesn’t work under such conditions. The in-line remote control buttons feel solid, and the whole construction quality is better than what you’d expect for the price. 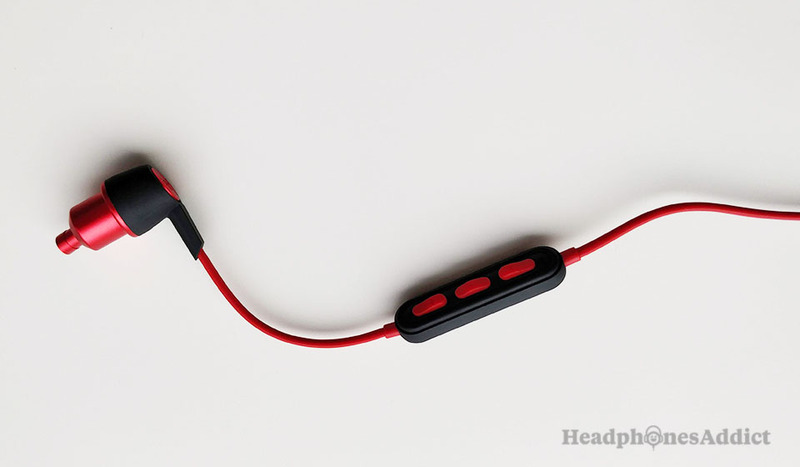 Also, the earbuds have magnetic surfaces so you can wear them as a necklace. Unfortunately, the magnets seem weaker, and the connection often loses its power during movement. So you have to be a bit careful not to lose them accidentally. Remote control buttons are sturdy and easy to use. Together with quick-charging battery and memory foam ear tips you also get an in-line microphone and remote control with 3 buttons. The microphone is of reliable quality, and the caller won’t know you’re talking with a Bluetooth headset. You won’t get any complaints about the voice quality which is a positive feature in this price range. Moreover, the remote controls are the standard play/pause the music, turn on/off, volume up/down, song next/previous (hold +/- for 2 seconds) and also accept/decline a call when the opportunity arises. You get more ear tips than usual at this price. 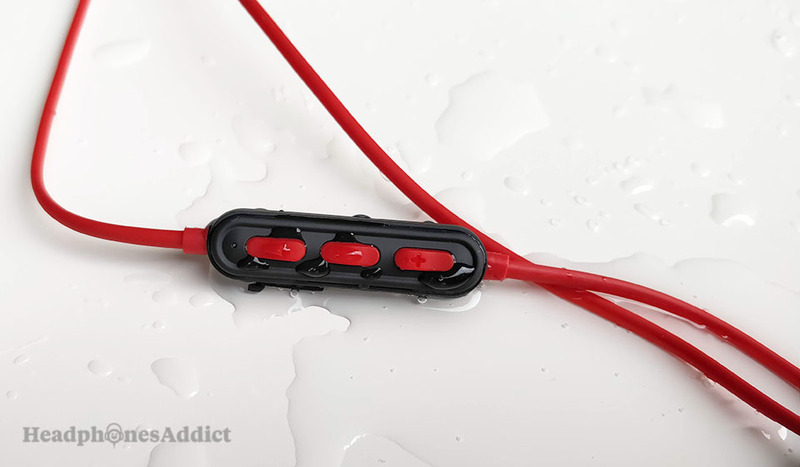 With most earbuds, you get 3 pairs of silicone ear tips (S, M, L). With Origem HS-1 you also get 2 pairs of memory foam tips (grey ones). Additionally, you get a soft carrying bag made of faux leather and a cable management piece. Nothing special overall, but considering the price this is more than you’ll get with other waterproof wireless earphones for this price. It’s a pleasant surprise, and you’ll get a feeling you paid more money for them. HS-1 have a pleasing sports oriented audio quality. The audio quality satisfies as well. 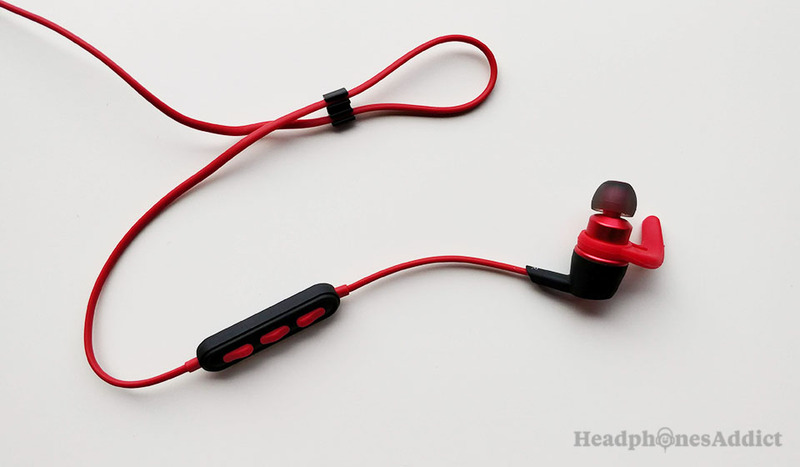 The earphones support aptX Bluetooth codec which improves the signal transmission. They have a typical V-shaped sound signature with an emphasis on treble and bass. It’s the perfect combination for working out when you want the strong bass to give you rhythm and clear highs for contrast. They sound great with pop, electronic dance music, hip-hop and other “bassier” genres (most common in the gyms). The first thing we noticed is that they are louder than most Bluetooth in-ear headphones and we got satisfactory volume at below the halfway point. If you want excessive lows to give you motivation, these are for you. However, if you prefer a more balanced signature and generally listen to calmer rock, pop, and classical music you might want to look elsewhere. The bass is big, heavy, and boomy overpowering the mids. Sub-bass has a decent extension as well, but you need an airtight fit for this. Otherwise, you won’t hear it. The middle range is subdued and generally doesn’t shine as much, typical for all V-shaped signatures. Likewise, the treble is emphasized though not sibilant. You get quite a lot of details and decent instrument separation, better than comparable wireless earbuds. Anyway, the highs can be a bit harsh at higher volume, pointing to the fact that you’re listening to cheap wireless earbuds. Moreover, the soundstage is about average which is what you should expect for the price. 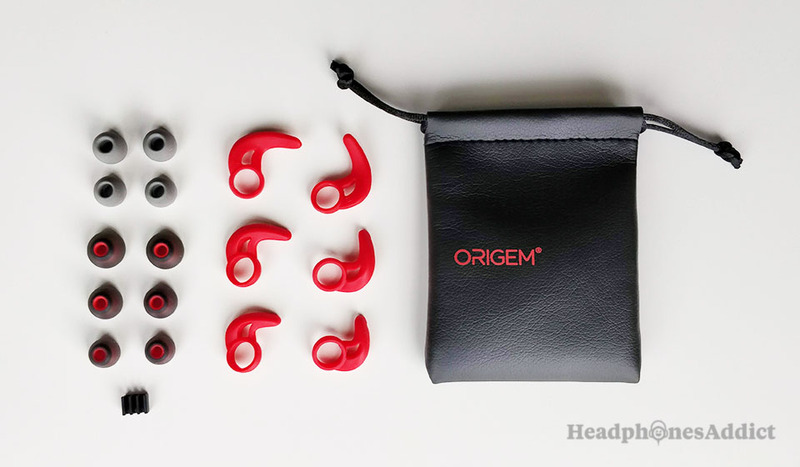 In the end, Origem HS-1 have one of the most enjoyable V-shaped sounds that is geared towards a sports environment and offers more audio quality than most in-ear headphones for the same budget. Origem HS-1 have one of the better water-resistance ratings in the category. All in all, for the price you pay, you get a lot of value for your money. It’s a quality product with better than average variety of accessories, fantastic battery life, and reliable performance overall. 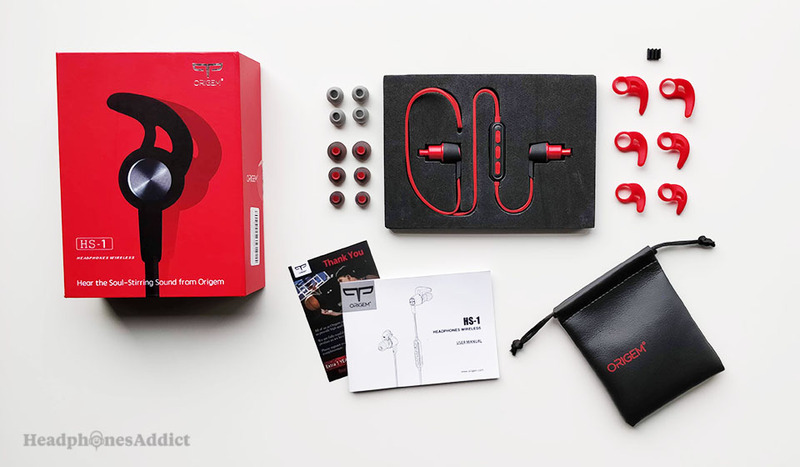 If you’re an avid gym-goer or a devoted runner and want cheap wireless earbuds (under $40) that are fully waterproof and have likable sound, Origem HS-1 are an excellent choice. What do you think of our review? Did we miss something? Please comment below.